This weekend I learned how to programs apps for Android in order to do a computer science badge with the Girl Scouts. I had volunteered last fall to do an activity with them as a way to encourage girls towards computer careers. 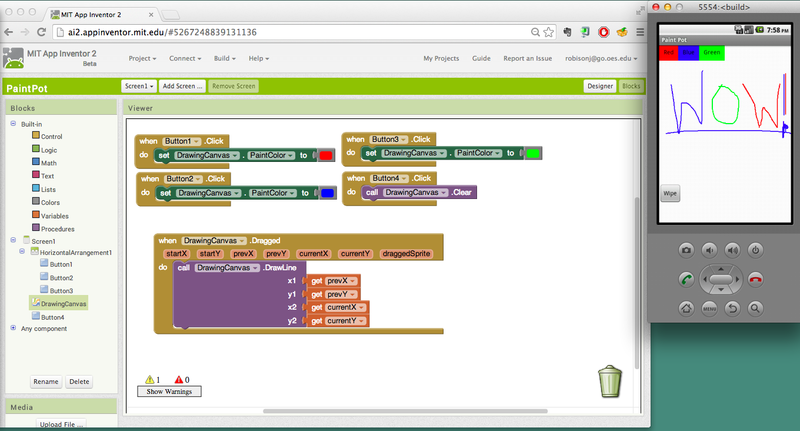 If finally makes sense to me why we teach Scratch. When I saw the blocks editor, I recognized the format immediately – and so did the 4th graders. They caught on pretty quickly, even if my explanations weren’t quite as practiced as would have been helpful. The girls had AMAZING ideas for apps. One where you bounce on a trampoline and try to break a glass ceiling. (As I was standing there teaching programming to girls, there was some meta awareness about them designing a game to break a glass ceiling.) One where you are animals and have to fight poachers. Another one where you get to go to a virtual school and experience what a day is like – wouldn’t that be an amazing tool for kids new a school from a very different background if they could walk through a day, kind of like an orientation? Sounds like this game from GLS. I love that I have a job where I get to learn new things with kids.